A gluten free Angel Food Cake from scratch…now that’s the kind of culinary challenge I like. And so that was my challenge for the month of May, in honour of Celiac Awareness Month. For many years I made (and later bought) an Angel Food Cake and took it to my friends annual piano soiree. An event where I would perform one piano piece and as it turned out over time, an event where everyone looked forward to my beautiful Angel Food Cake. This dessert was definitely a piece of cake when I bought it at the store. Just cut it in half, fill it with sweetened whipped cream and garnish with edible flowers. Everyone thought it was a masterpiece and I guess it was, but it was really pretty simple. That is, until I wanted it to be gluten free. Angel Food Cake is a light, airy sponge cake made with a dozen egg whites whipped full of air. Egg whites from real eggs are essential. Do not use egg whites from a carton which have been heated in processing. For the classic look this cake should be cooked and cooled in an Angel Food Cake pan with tall sides. Modern versions include Angel Food Cake pans with a removable bottom, which would be nice to have but for a once-a-year cake I borrow my sisters pan. If you like the idea of making Angel Food Cake then purchase a good quality pan, and lend it to your sister if you have one. Two essential steps for baking an Angel Food Cake are to bake the cake in an ungreased pan and cool it upside down. Yes, really. Not greasing the pan allows the cake to stick to the sides of the pan and climb up it as it bakes. Cooling it upside down helps maintain the light, airy texture. I remember my mom cooling her Angel Food Cake upside down balanced on an inverted drinking glass. I wonder if that is the pan my sister now calls hers. Some occasions simply call for cake and for me, it’s going to be homemade and it should have a gourmet look. My piano soiree was always held in June so I decorated my cake with colourful spring pansies. I actually go to the garden centre and buy pansies in the colours I want, with this dessert in mind. 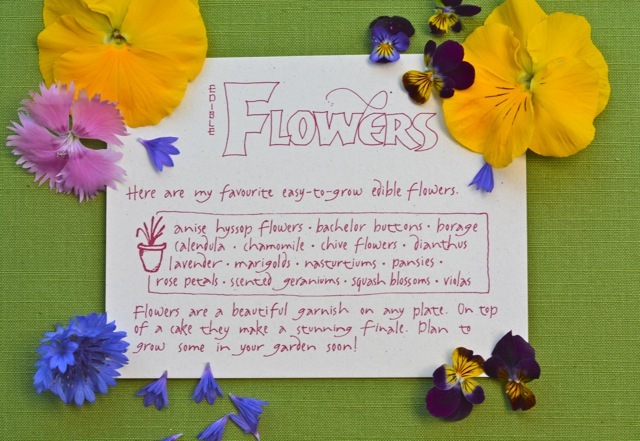 If you are keen to use edible flowers check out my post, How To Use Edible Flowers in the Kitchen, where I outline the different flowers I grow. Only when you start to cook gluten free do you realize the amazing properties of wheat flour. Purchased gluten free flour mixes work for some recipes but not all. The more gluten free baking you do you can’t help but notice companies have a flour mix for cookies and a different one for bread or pancakes, and the list goes on. This is the reminder that no single gluten free flour can replace all the properties of wheat flour. This means gluten free bakers need a positive mindset in the kitchen and be open to learning. Follow my year-long blog post series of How To Use Gluten Free Flours if you are interested in learning more about the properties, pros and cons of different flours. For this once-a-year cake I want it to be fabulous, not just be okay. I knew I needed a lighter cake flour recipe rather than the blend I use for muffins. For this light, airy Angel Food Cake I needed to made a special flour blend. I know that including a flour blend in a recipe suddenly makes the list long and appear complicated. But the cake isn’t complicated so I just ask that you think of the special flour blend as a special project. Make it and get it in the cupboard before the day you bake. 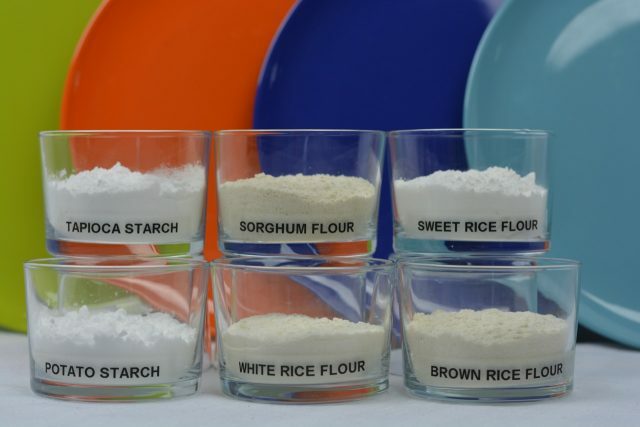 Baking by weight is how to get the best results (read more in this post Baking By Weight) but most home cooks have cup measures and prefer recipes written that way. I measure my flours by weight when I make a blend, but then I measure by the cup to bake. This recipe is an exception where I give the flour by weight. I’ll make this cake a few more times and let you know I can make it with a cup measurement. Thanks to Nicole over at Glutenfree on a Shoestring for her homemade cake flour blend recipe. It worked well in my kitchen and this is my take on her recipe. Let me know in the comments below if you used this flour blend or tried something different. Use up this cake flour blend in any of these recipes and notice how it works. This recipe for Basic Banana Muffins is my go to for experimenting with gluten free flour and using up leftover blends. The recipe description includes details of how I do that. Make cake flour blend by weighing each ingredient and combining them in a food processor. Process for one minute to finely grind the milk powder and mix everything. Store in an airtight container. Preheat the oven to 350°F. DO NOT grease the Angel Food Cake pan. Place a strainer over a bowl and add first amount of icing sugar, cake flour, xanthan gum and salt straining it into the bowl. Move the strainer over a second bowl and again sift the mixture into that bowl. Repeat sifting the mixture 4 times. In the large bowl of a stand mixer beat the egg whites, water, cream of tartar and vanilla on medium-high speed. Gradually add the second amount of icing sugar a few tablespoons at a time. Continue beating on medium-high speed until soft peaks form, 3-4 minutes. Increase speed to high and beat until peaks become stiff and glossy, 2-3 minutes. In stages sift the flour mixture onto the egg white mixture and gently folding it in. Pour the batter into the Angel food cake pan. Lightly tap the pan on the counter a few times to settle the batter. Bake in preheated oven 30-35 minutes or until a wooden skewer inserted in the middle of the cake comes out clean. Cool the cake upside down on an inverted glass or bottle until completely cooled, about 2 hours. Whip the cream with the sugar and vanilla until it forms stiff peaks. Prepare the fruit. Once the cake is completely cooled remove it from the pan. I use a small plastic spatula to do this. Using a serrated knife cut the cake in half horizontally. Place the bottom half on a pedestal tray (easier for decorating and makes a nice presentation). Top with half of the whipped cream and push some fruit into the cream. Place the top half of the cake on top. Drop whipped cream onto the top of the cake by the spoonful pushing it close to the edges but not over the sides. Decorate with more fruit or fresh edible flowers. Refrigerate until serving.